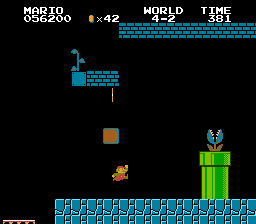 NES Super Mario Bros. (PRG0) "warps" in 05:05.9 by Michael F.
This movie is 2 seconds faster than its predecessor. Most importantly it shows a major increase in production quality evolving in SMB TASing. This movie polishes the little optimizations and makes the most of the tricks that were known at the time. It also does a good job with entertainment. It tries to kill enemies and get coins as much as possible along the way, plays with death, and doesn't jump higher than necessary to reach ledges.